Monarchs are probably among the most well-known butterflies — they’re certainly easy to identify with their orange and black wings. We’re seeing fewer every year, though, and scientists are concerned enough that the U.S. Fish and Wildlife Service is considering protection under the Endangered Species Act. Why? Mainly because of climate change and a shrinking habitat, report the people behind Monarch Watch. “We have a lot of habitat in this country but we are losing it at a rapid pace. Development is consuming 6,000 acres a day, a loss of 2.2 million acres per year,” writes Monarch Watch Director Chip Taylor in a news release on their website, Bring Back The Monarchs. Unpredictable weather took a large toll on the population this year. 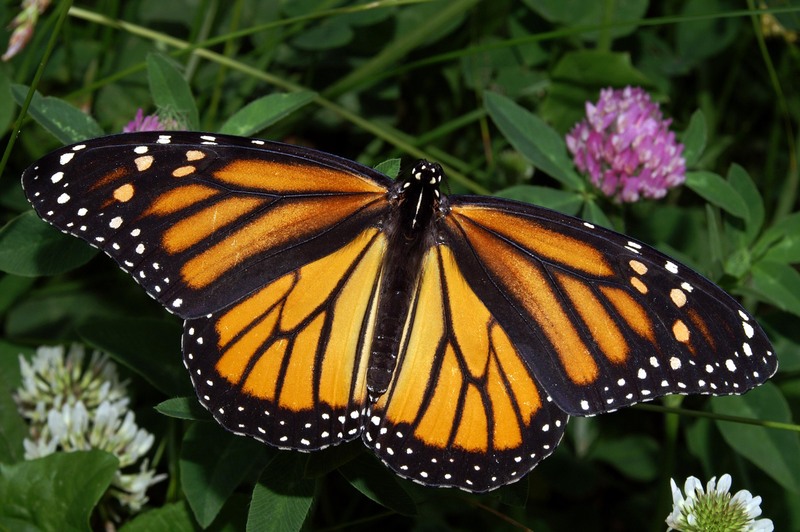 In February, USA Today reported that there will be about 20 million fewer Monarchs this season. Wet, cold weather combined with tree-toppling storms where the butterflies overwinter in Mexico, and millions of the insects were killed. The good news is, there’s still hope — and almost anyone can help. You don’t need to do anything drastic or spend a lot of money, either: Just plant a simple butterfly garden (Monarch Watch says any size will help, from a window garden on up) and ensure it has a few varieties of milkweed plants. Milkweed — or rather, a lack of it — is one of the reasons these orange-winged beauties are vanishing. As the name implies, most people consider it a weed – and it’s been steadily eradicated from lawns, gardens, and fields for years. Monarchs, however, need it to survive: They’ll lay their eggs only on milkweed plants, and the caterpillars will eat only milkweed leaves. These leaves are poisonous to other bugs and animals, but the monarchs thrive on them – in part because it makes them poisonous to other critters that might otherwise consider them lunch (fun fact: many brightly colored insects are poisonous — the color is a warning to predators). You can find milkweed seeds and plants at some nurseries (call first). Locally, The Rodale Institute and Edge of the Woods Farm have carried them, and Monarch Watch has a Milkweed Market. You can also search online for retailers who will ship the plants — just be sure to get native varieties. You can find out the right kind, along with other native plants to grow, on this site from the PennState Extension. When planning your garden, you want to locate it in a sunny spot that is somewhat sheltered from the wind. Plants should be clustered together, and if you have enough room, there should be six or more milkweed plants. To find learn more about how to build your butterfly garden, check out the North American Butterfly Association. And once your monarch garden is done, you can get it registered as an official Monarch Waystation. If you do start a butterfly garden, share some pictures with us on our Facebook page!